A transcript request letter is used to request a transcript of your high school or college records. Once this form is completed, simply sign and mail to the appropriate school. You will need to fill out a transcript request letter if you are transferring schools or applying to school. You may also need a transcript request letter if you are applying for a job and the employer requests a copy of your transcript. Get started Start Your Transcript Request Answer some questions. We’ll take care of the rest. 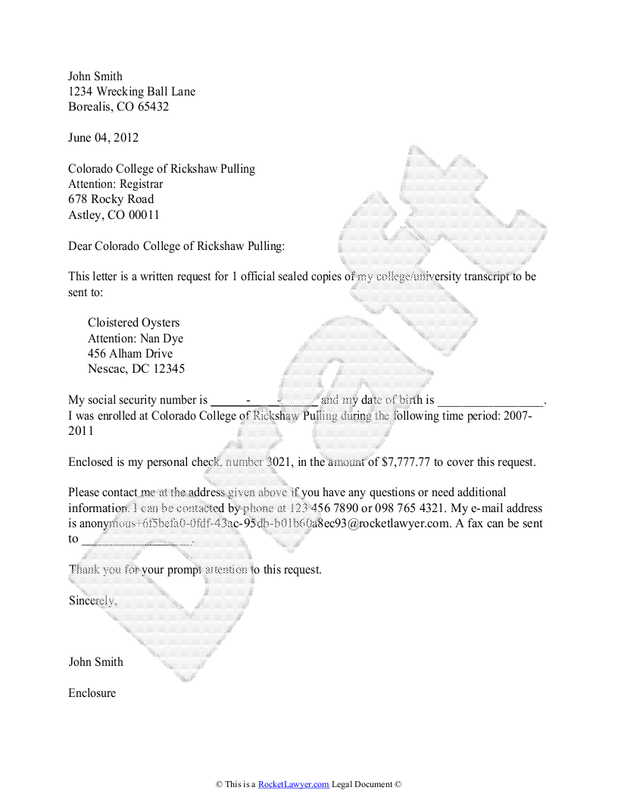 The sample transcript request letter below depicts John Smith requesting a transcript from his alma mater, the Colorado College of Rickshaw Pulling. Sample Transcript Request. The create your own personalized transcript request, click on the image above. You will probably run into several instances where a transcript request template may be necessary, such as when applying to schools or applying for work. Want to get started? Simply click on the link below to start your personalized transcript request. You can also browse our help articles for further information about related topics, such as studying abroad and how marital status affects student aid eligibility.